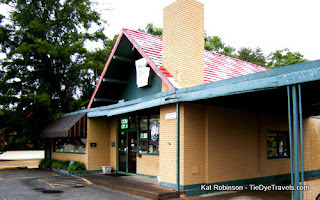 Now, I can see where someone might want to say that the standard burger at Arkansas Burger Company might not rate up there with the burger at, say, Midtown Billiard’s. ABC’s straight burger is wide and flat on a sesame seed bun, a little like a burger from the backyard grill served with a bag of chips. If you look at it that way, doesn’t have much on anything else, right? You gotta splurge sometime and get The Rock. 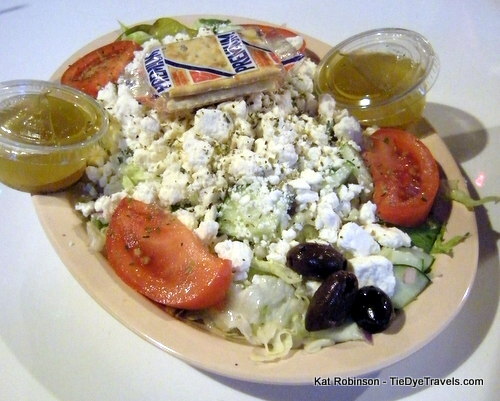 For $6.50, you can have an experience. 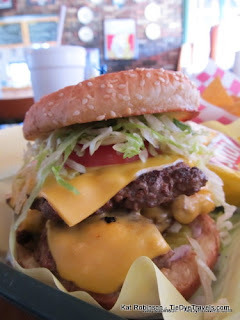 The big two-fisted burger comes on a buttered sesame seeded bun — that end up three inches apart thanks to two gigantically thick half pound patties coated in cheese, hamburger dill pickles and white onion on the bottom, shredded iceberg lettuce and a big thick slice of tomato on the top. Those loose-packed hand formed patties have a nice light burger crust, seasoned with a little salt, pepper and Greek seasoning. They’re so loose packed that when you bite down the burger breaks off into your mouth. This burger is so juicy, it’s about the only local burger I usually order without condiments. It serious holds its own without ketchup, mustard or mayo. 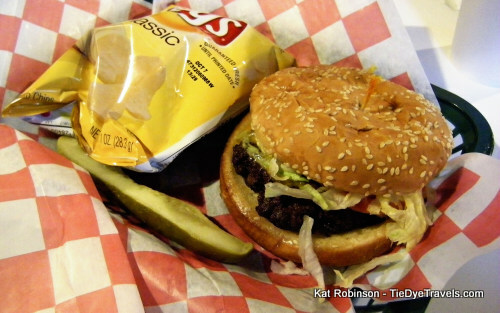 There is one thing that I don’t like about the burger — and that’s the fact that it comes with just that one little pre-packaged bag-o-chips. If you have the money and you’re planning to share the burger anyway (which, seriously, it’s a pound. It doesn’t need to be consumed by one person in one sitting), you need to order some cheese dip (small $4.95/large $6.95). It’s a whitish queso with tiny bits of green pepper. It’s worth fighting over. 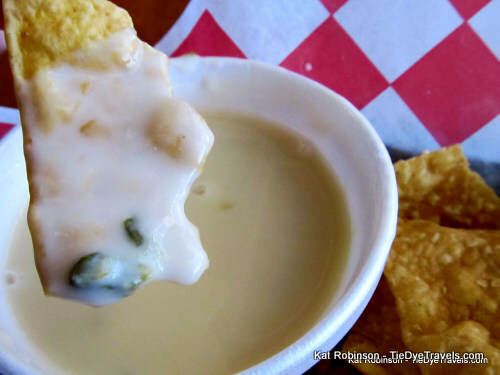 I have a lot of friends who believe it’s the best cheese dip they’ve ever had. I’m not one of them, but I can appreciate it. 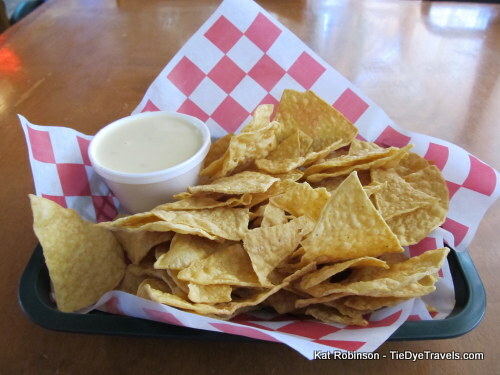 The queso is of medium thickness, has a mild flavor and goes well with the salty yellow tortilla chips they provide — though, to be honest, I usually eat them with the Lay’s that come with my sandwich. 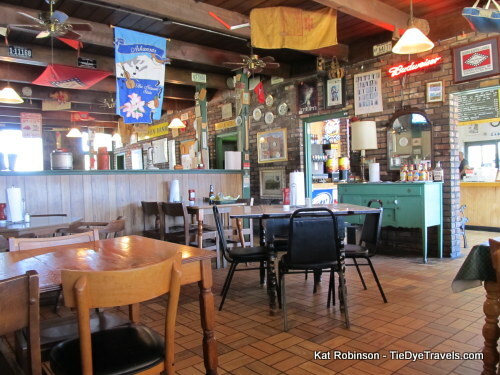 One more reason you should go to Arkansas Burger Company, if you’ve never been… the décor. If you’re from around these parts you’ll probably sight something on one of the walls that brings back a wave of memories. It’ll smack you in the head. The interior of the restaurant has become a repository for all things Arkansawyer. And that’s worth seeing in itself. You’ll find Arkansas Burger Company at 7410 Cantrell Road. It’s open 11 a.m. to 9 p.m. Tuesday through Saturday. (501) 663-0600 or check out the Facebook fan page.